Inspired by a Joyce Meyers quote, "we must remember we are stewards of what God has provided for us, not owners", the School Council recently launched their Charter for keeping St Martin's clean and tidy during a whole-school assembly. They also shared their research which showed that keeping a clean and tidy environment reduces stress, increases educational outcomes and makes a better first impression. The School Council also launched a competition inviting students to design a poster encouraging students to keep the student toilets clean and tidy. Congratulations to Sarah Cummings from Year 10 for winning the competition. As well as receiving a prize, her artwork (left) is now displayed in the school student toilets. The School Council would like to thank all those who participated in this competition. Ms Ryan, the judge, very much enjoyed reading through all the entries. 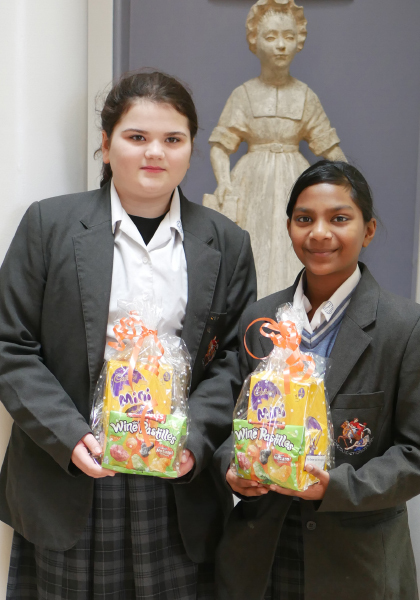 Congratulations to the winners, Navitha from Year 7 and Paige from Year 9. Navitha wrote about Rosa Parks, an American activist in the Civil Rights movement known for her pivotal role in the Montgomery bus boycott. The US Congress called her the first lady of civil rights. Paige researched the life and times of Emily Davison, a suffragette who fought for votes for women. She was arrested on ten occasions and went on hunger strike seven times. She died after being hit by King George V's horse at the 1913 Derby when she walked onto the track during the race. Some people believed she was trying to pin a badge about women's rights onto the horse but failed. She stood up for what she believed which is an important lesson for us all.